Presumably given its name because even the laziest player can get to grips with gameplay in two seconds flat, it is Couch Potato from Microgaming which we’re putting under the microscope here. 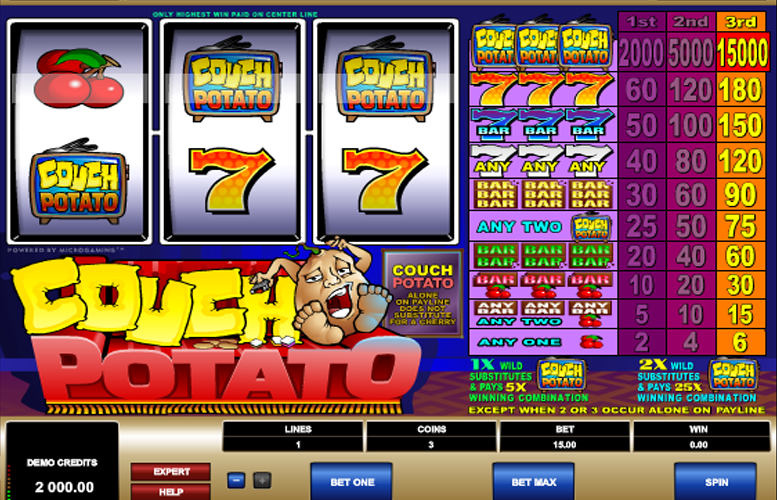 Themed after traditional slot machines which used to frequent pubs and arcades, Couch Potato undoubtedly keeps things simple. The three reel and one payline slot utilises recognisably classic symbols, such as bars and cherries, and adds just a single wild symbol to make things a bit more interesting. That wild is crucial, though, as it is not only the game’s most valuable symbol but also helps to boost other payouts to boot. The simple, straightforward and traditional nature of Couch Potato makes it really easy to understand and is sure to appeal to those players who love classic slot games. A wild symbol is introduced to gameplay as the most valuable of all the symbols, and can also multiply winnings by either five or a whopping 25, depending on if one or two take their place along the payline. Whilst simple, Couch Potato’s appearance is attractive and the fact that the reels spin like real fruit machine reels is satisfying. Couch Potato does not include free spins, bonus rounds or any other additional gameplay features which many players will have become accustomed to. Away from the top, three wild symbol combination, Couch Potato’s payline jackpots are quite disappointing. Higher rollers will probably not like the fact that the maximum they can bet per spin when playing Couch Potato is only £75. Three Couch Potato Wilds = 2000x coin value for one coin, 5000x for two and 15000x for three. Three 7s = 60x coin value for one coin, 120x for two and 180x for three. Three 7 Bars = 50x coin value for one coin, 100x for two and 150x for three. Given that Couch Potato largely keeps things very simple and classic, it should come as no surprise that the slot does not include any bonus rounds or side games. It does have a wild symbol, however, which plays a double role. Firstly, the wild substitutes for all other symbols to help make up differing winning symbol combinations. When it does that, what’s more, the wild also enhances the payouts provided by those winning combinations. If one wild is involved in a combination, it multiples the payout by a handy five times. If two wilds substitute for another symbol to make up a combination, meanwhile, the payout for that combination will be fully 25 times larger than it would otherwise be. This is obviously not the case if two or three of the wilds line up alone along the payline. One Cherry Symbol on the payline = 2x coin value for one coin, 4x coin value for two and 6x coin value for three. Two Cherries = 5x coin value for one coin, 10c coin value for two and 15x coin value for three. Any Three Bars = 5x coin value for one coin, 10c coin value for two and 15x coin value for three. Just like everything else related to the Couch Potato slot, choosing how much to bet per spin is really simple. Players can choose to bet either one, two or three coins and can set the value of those coins at between 25p and £25. That makes the minimum possible bet just 25p and the maximum possible bet £75 (£25 x three coins). The payouts available for different symbol combinations differ depending on how many coins are bet, with the highest jackpots only available when the maximum of three are wagered. You can’t really directly compare Couch Potato with many other online slots, as it is essentially a different kind of game. It is aimed squarely at players who want as simple and as classic a slot playing experience as possible. As such, if you like your fancy graphics and extra gameplay features, Couch Potato is not for you. If you do want a straightforward, traditional slot game, however, you can’t go far wrong with this option. Couch Potato creates a real feeling of using a traditional slot machine with just the introduction of a wild symbol to make things a bit more interesting. The beneficial multiplier which that wild can introduce to payline jackpots, too, really helps to boost the slot’s generally less generous payouts. This game has a rating of 3 / 5 with 371 total reviews by the users.